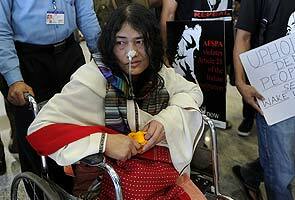 New Delhi, Mar 5 : Social activist Irom Sharmila, who has been on fast for about 12 years demanding the repeal of the controversial Armed Forces Special Powers Act (AFSPA), refused to plead guilty of attempting suicide, and a Delhi court framed charges against her. Metropolitan Magistrate Akash Jain framed charges against her for attempt to commit suicide and issued show cause notice to Ms Sharmila after she refused to plead guilty. She told the court that she "loves life and does not want to take her life". Ms Sharmila, who was present in the court, refused that she attempted to commit suicide here at Jantar Matnar in 2006. She said: "I only want justice." "If I wanted to commit suicide I might have died. My protest was non-violent for my demand, just to live as human being," she added. She appeared before the court under IPC 309 (attempt to commit suicide) for fasting at Jantar Mantar in Delhi. The court hearing the case told Ms Sharmila: "We respect you but the law of land does not permit you to take your life." When asked if she tried to commit suicide she replied "No". The court earlier told her counsel to explain to her that maximum punishment in the case was a few months to a year and that she has been in custody for more than 6 years, so if she pleads guilty, the case would be settled on Monday. Meanwhile, her supporters are protesting outside gate no. 2 of Patiala House Court, which has been closed by police. They raised slogans for justice and against AFSPA.